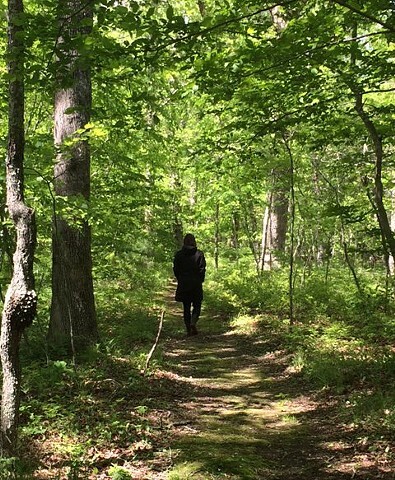 green is the forest we wander... is a 15-minute site-specific audio walk that invites participants into the forest imaginary populated by things magical and unseen. Using cues in the landscape as guides to research, on-site investigation, and poetic inscription, the audio essay wanders through Mie's Trail, a reclaimed gravel pit and natural preserve. The hybrid essay is culled from many sources and amplified and enlarged by my own writing woven within the fragments. The sources look at the ancient (and present) role of moss in our ecosystem, and ecology in general, and are drawn from J. M. Glime's expansive Bryophyte Ecology, research by bryologist Robin Wall Kimmerer, writing by Michael Pollan in The Botany of Desire, various recent news sources, and a North American Cree tale sourced online. Also referenced are Gaston Bachelard on the forest and the work of Matthew Tiessen on desire lines.